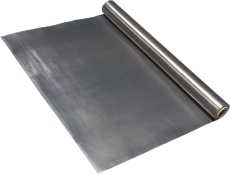 Schneider Protect is a lead foil for radiation and sound insulation. Gap-free radiation protection installations require the use of extensive materials. Often whole rooms have to be cladded with radiation protection material in hospitals and in Doctor's practices. Schneider Protect is a particularly economic material for this purpose. Even a thin lead sheet is capable of effectively weakening radiation. Schneider Protect is available in long strips and can be cut to size for the respective application. Schneider Protect can simply be applied to walls and ceilings using special contact adhesives. Due to the easy mouldability of the material, even round and square surfaces can be quickly and economically insulated. Schneider Protect is produced as a standard series in material thicknesses from 0.25 to 2.00 mm and in widths from 500 mm and 1.000 mm. Schneider Protect-SK is a self-adhesive wallpaper made of lead for the building sector. Schneider Protect-SK is easy to handle and quick to manipulate and offers flexible solutions implementing radiation protection and noise protection. The surface should be sufficiently capable of bearing, inherent stable as well as free from oil, dust or any other contamination. Due to its high inherent weight, Schneider Protect can also effectively insulate against noise. 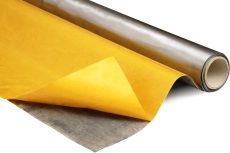 The improvement depends on the thickness of the lead foil and the conditions of the noise flanking sound passages. Schneider produces additional accessories as self-adhesive lead stripes to cover joints, radiation protection channels for sockets as well as self-adhesive cover plates for screws and nails. Further dimensions and flat material are available on request.